G2A.COM G2A News Latest News Praise Todd Howard! In a Fallout 4 mod. I don’t usually write about mods for Bethesda games here, even though that’s one hell of a rabbit hole. But about this one I will, because it involves Todd personally. 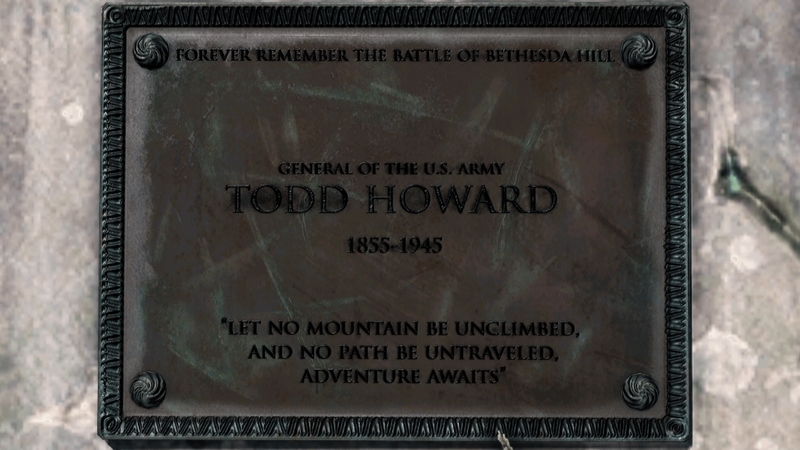 Created by one Wanaming0, General Todd Howard Statues adds just what it advertises: craftable statues of Todd Howard, the heroic general responsible for the victory at “Bethesda Hill”. His memorial plaque reads: “Let no mountain be unclimbed, and no path be untravelled, adventure awaits”. You can also replace the statues of the Minutemen with the watchful, calm visage of Todd. Additionally, you can discover a new Mysterious Statue worshiped by a branch of the Children of Atom. Their holy texts repeatedly emphasize how “it just works”. I assume his comment made at this year’s E3 stating “sometimes it doesn’t work” has led to a schism and whole heretical sect of Todd naysayers. But we here at G2A are Todd purists. He died for your gaming sins you ungrateful wretch, repent now and bow before Godd Howard! Lest ye be stricken down by his mighty Chess Clubber! Praise him! You were there when the bombs fell, and you were put in cryostasis in one of the vaults. Before you could fully unthaw, your child was taken from you, and the world you emerge to is very different from you remember. What are you going to do about it?